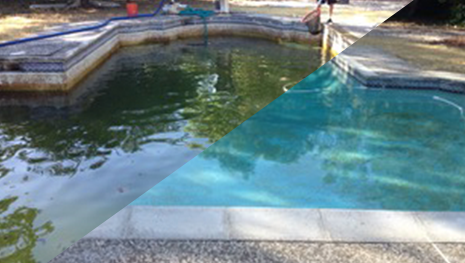 Superior Pool Care for Danville, Alamo, Blackhawk, Diablo, and Surrounding Areas! ​Pure Pool Solutions provides regular pool maintenance and repair service in Danville, Alamo, Blackhawk, and Diablo. Other repair service areas include Walnut Creek, San Ramon, and Dublin. Call now to learn more! As a long-time pool owner myself, I know the importance of a pure pool. For many years I have enjoyed caring for our family pool. And over time we tried outsourcing the maintenance, only to be disappointed by the quality and reliability of many of the people we hired. Many of our friends and neighbors shared our experience, and turned to us for help. That&apos;s why I launched Pure Pool Solutions, a full-service pool maintenance company offering the same quality and reliability I have always insisted upon for my own pool. Insist on a pure pool solution for your pool today. At Pure Pool Solutions, we specialize in taking a green, algae pool to a clean, clear pool. We offer pool inspection services for realtors, home buyers, and sellers! We are proud sponsors of the San Francisco Firefighters Cancer Prevention Foundation, which helps fund research for the high number of cancer cases among firefighters. Why Choose Pure Pool Solutions? Pool maintenance is more than just "adding and balancing chemicals". Although it is an important component in maintaining a pool, it is only part of keeping a pool safe for swimming and aesthetically pleasing. Without consistent monitoring, chemical balance can rapidly change due to temperature, contamination, or usage, creating a water condition that is unhealthy to swimmers and damaging to the pool&apos;s surface and equipment. Today&apos;s pool equipment is capable of effective circulation and filtration with the assistance of a pool sweep but also requires regular service to maintain efficiency. Maintaining the equipment also assures that it operates economically. The pool itself requires regular attention. Brushing the walls will dislodge algae spores and dirt. Brushing the tile will minimize the calcium buildup that creates a waterline and scale. If a homeowner is unable to allocate the time needed to maintain a pool on a regular basis (weekly) then the services of a pool professional is worth considering. We provide services to the Danville, Alamo, Blackhawk, and Diablo areas. Click here to read more reviews for Pure Pool Solutions.